MLS LIVE is your passport to watch Major League Soccer however you want. 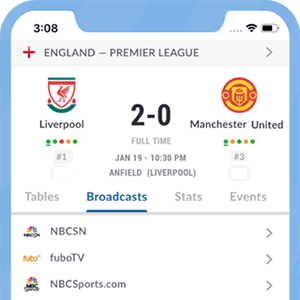 One subscription gives you access to hundreds of live games on the web, iPhone, iPad, Android phones and tablets, Roku, Apple TV and Panasonic connected televisions. MLS LIVE extends the existing MLS TV experience by providing access to hundreds of out-of-market matches. It is the perfect option for watching the biggest MLS stars, following players on your fantasy team, scouting an upcoming opponent, or watching your home team while you are out of town. MLS LIVE is available in the U.S, Canada and Mexico. Nationally televised matches are blacked out, but become available 48 hours after the match in the MLS LIVE archives. Local blackout rules may also apply. *Got itLive Soccer TV does not provide MLS Live live streaming. The information provided on this page is simply MLS Live soccer TV schedule.